We get a one-two punch of wind in New England Wednesday. This morning, a powerhouse nor’easter is racing northward, passing about 200 miles east of Boston Wednesday morning. 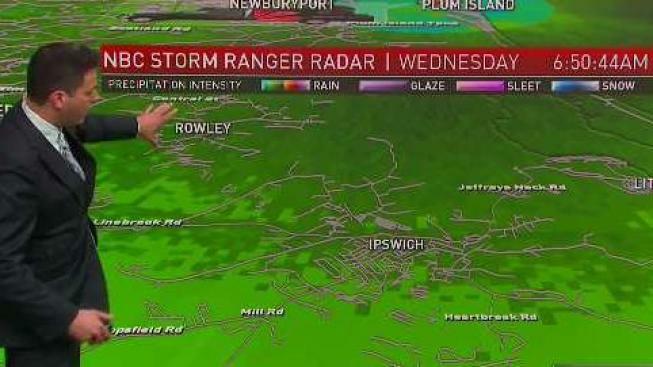 This storm-generated wind gusts past 50 mph near the beaches in eastern Massachusetts, as well as a burst of rain and April snow for the morning commute. The wintry mix shuts down by 9 a.m. in southern New England, but may go through noon in parts of Maine. For most of us it’s just heavy, wet snow that melts very quickly. But in some of the hilltops, we may get a couple to several inches on the grassy surfaces that will last a little longer. Most of the roadways are just wet, but visibility is poor. This storm is moving so fast that the sun should be out for most of us by mid-morning, if not sooner. Wind from the north will ease in eastern New England, but there’s more to the weather map than just this ocean storm. There’s also a significant low-pressure system in southeastern Canada pushing a front into northwestern New England Wednesday afternoon. Ahead of that front, the air is much warmer. High temperatures will be near 60 degrees, including areas that will have snow Wednesday morning. As the front comes in, wind will pick up and gust from the west past 45 mph. There is a wind advisory for much of New England Wednesday afternoon and into Wednesday night. Also with that front, we may see a few rain or snow squalls in the mountains of northern and western New England. Cooler and drier air blows in Wednesday night, with temperatures once again down to freezing by Thursday morning. High pressure from Canada brings us a nice Thursday with plenty of sunshine and light wind. Highs then will be close to 50 degrees. Things are moving very quickly in the weather department, and another system is on our doorstep early Friday. It is a warm front that will bring in clouds and a wintry mix of rain and snow to southern and western New England during the morning. Once again we may get a coating of snow in higher elevations. Otherwise, it looks like a few hours of rain, with temperatures in the 40s to near 50 degrees at lower elevations. If all works out just right, we should get a mild high-pressure system in here for the weekend, with plenty of sunshine and highs both Saturday and Sunday near 60 degrees. It gets complicated once again early next week, as a deep trough will move into the eastern United States. Rain and probably warmer air will be here for Monday, and perhaps Tuesday for the home opener at Fenway Park. But there will also be many spring showers, and enough cold for rain to change to snow in the mountains before it dries out around Wednesday.